Pudding Cottage07469 242747work Self-cateringPudding Cottage is set in the heart of the picturesque conservation area of Bakewell. the cottage has been totally renovated and provides a very high standard of accommodation for 4 people (2 adults and 2 children). Pudding Cottage is an ideal base for a relaxing break in the Peak District. Everything you need is within walking distance - 200 yds to the centre of Bakewell with its shops and restaurants, yet the cottage is set in a quiet back water. Exploring the Peak District and Derbyshire couldn't be easier, with Chatsworth House, Haddon Hall and many interesting villages and market towns like Buxton and Castleton within easy reach - there's something here for everyone. Pudding Cottage offers weekly bookings starting on Friday and short breaks of 3 days starting on Friday and of 4 days starting on Monday in some seasons. 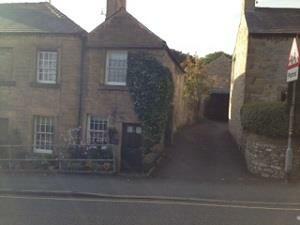 A fabulous renovated Grade II listed cottage built in 1751 set in the heart of Bakewell. Pudding Cottage provides 21st Century luxuries in a character location within walking distance of all amenities. From the roundabout in the centre of Bakewell take the B5055 (King Street, signposted toward Monyash). After about 100 m the road bends to the right (Orvis store on right hand side, Butts Road the turning on the left) and becomes South Church Street. Pudding Cottage is on the left hand side roughly another 100 m further up the hill, just after a small side turning on the left (Butts View), directly opposite the church steps. Bus Routes: Sheffield x18 or 240; Chesterfield 170; Nottingham, Derby or Manchester Transpeak. Bakewell has: an indoor swimming pool, Library, Art Galleries, Museums, Visitor Information Centre, agricultural & farmers markets, weekly markets, many wonderful shops, restaurants & cafes all within walking distance of the cottage. Children welcome from any age.